Is sugar a foe or a friend? In my several decades of working in the field of nutrition, I have seen a lot of misconceptions about different food and diets. Recently, sugar has been a topic on the news, particularly, the plans to label beverages which contain supposedly high amounts of sugar. Here, I offer my take on this issue. 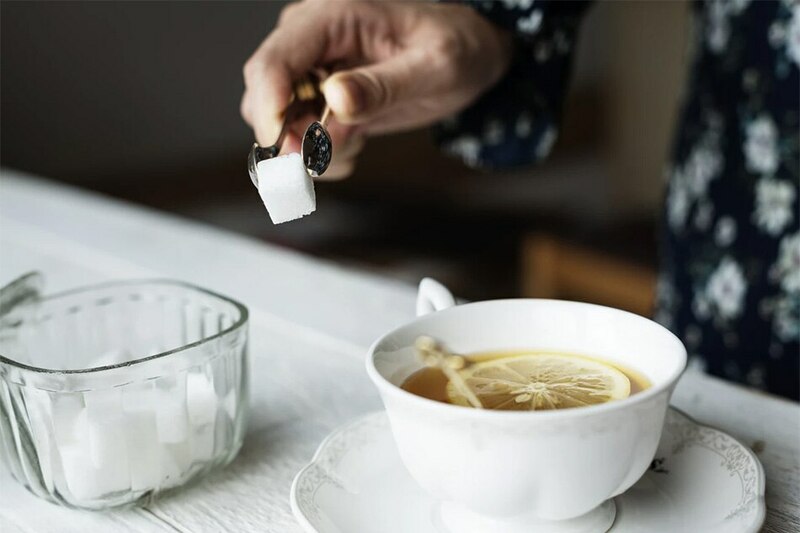 Sugar, especially sugar added to food, has lately acquired a bad name because of its purported association with diabetes, heart disease, obesity and other non-communicable diseases. However, these associations relate especially to those who habitually take high amounts of sugar, beyond the recommended amount. Under moderate intakes, the beneficial role of sugar to the body is often ignored. Sugar, per se, is not necessarily bad for one's health. 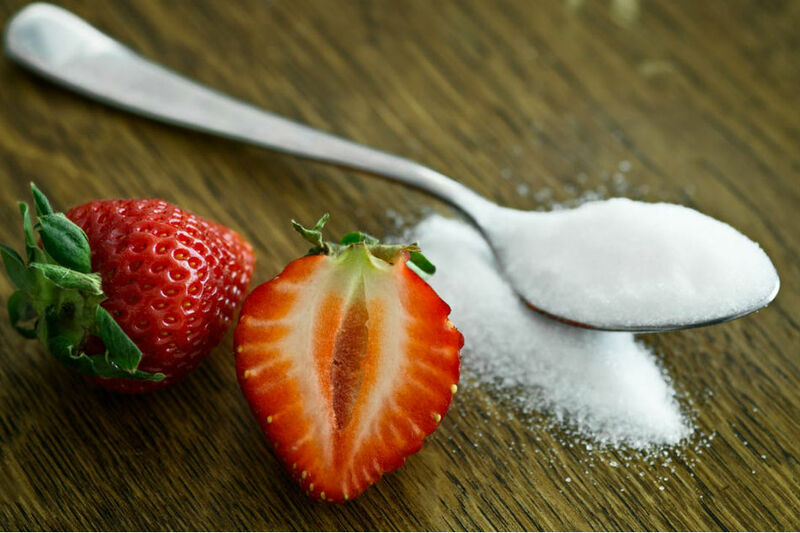 Sugars refer to the simple forms of carbohydrates, monosaccharides (such as glucose and fructose) and disaccharides (such as sucrose in table sugar and lactose in milk). They occur naturally in food, or added during manufacture, cooking or consumption. The World Health Organization (WHO) recommends that free sugar (both sugar added to food and beverages during production, cooking, or on the table, and sugar naturally present in honey, syrups, and fruit juices) should be limited to not more than 10% of total calories. For an average adult with a caloric requirement of 2,000 calories, this recommendation translates to 200 calories, equivalent to 12 teaspoons of table sugar. To put this into perspective, the average intake of a Filipino household of sugars and syrups is 47g per day, according to the Food and Nutrition Research Institute (2015). 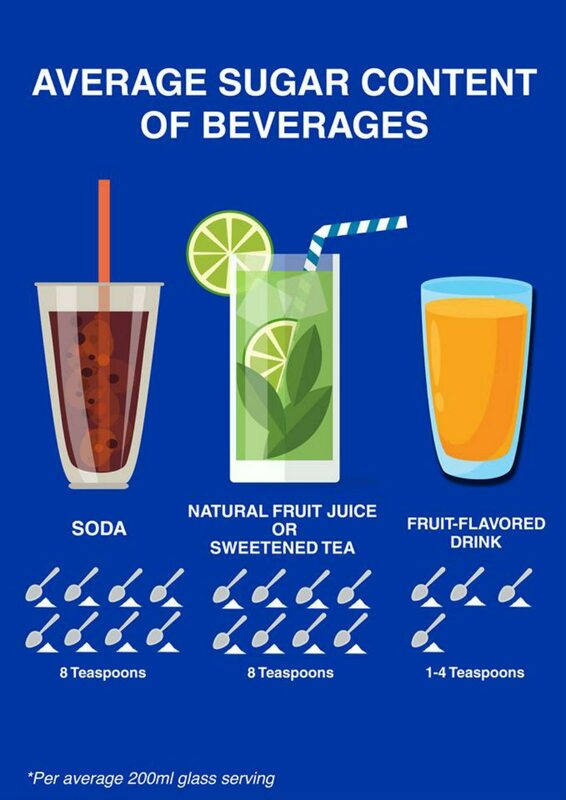 The more popular soft drinks contain from 25g to 30g of sugar (6-8 teaspoons) in a glass, while a glass of fruit juice or sweetened tea drink may contain about the same. Some powdered fruit drinks when reconstituted may contain even less. While it has been shown in various studies, the association of sugar to diabetes, hypertension, and cardiovascular disease, among others need further research to form firm recommendations, except to say that high sugar intake should be avoided by everyone following the WHO recommendation. However, a person predisposed to or suffering from obesity and these non-communicable diseases mentioned above are advised to limit their sugar intake, along with calorie reduction in the diet and increased physical activity. Sugar is actually a source of energy for the body's energy requirements. Besides its use in basic bodily functions, energy (measured in terms of calories or kcal) is essential for all physical activities. Simply sitting or exercising burns up energy. Just sitting in the office for an hour, for example, spends about 75 calories. Simple sugar is needed by athletes for their immediate energy needs before, during and after any athletic activity. In fact, the sole source of energy of the brain is glucose--without glucose, the brain cannot function. All of this energy is derived from simple sugar coming from starch, and intrinsic sugar found naturally in foods such as fruits and milk, and from sugar added to foods as in beverages, cakes, and coffee, among others. It occurs naturally in food -- even fruits and vegetables and rice contain sugar. It is useful to the body because it is a source of energy. Strong positive association of sugar to diabetes, hypertension and cardiovascular disease has not been clearly proven; it needs further research. We do not have to avoid sugar but rather, the excessive intake of sugar. WARNING LABEL ON SUGAR: IS IT NECESSARY? The government is proposing labeling beverages which contain high amounts of sugar. Could this help consumers ensure a balanced sugar intake? 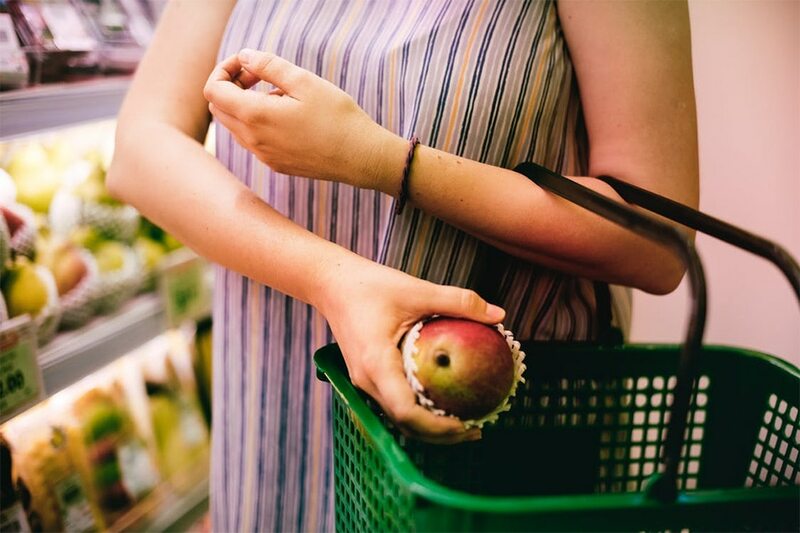 Several studies have shown that multiple symbols showing the level of calories and key nutrients such as fat, sugar, and sodium are effective in helping the general population compare products in terms of healthfulness. In turn, other studies have suggested that simpler front-of-pack (FOP) formats perform better than more complex systems. In order to be effective for everyone, the system has to be simple, clearly visible, recognizable, and rapidly comprehensible. If nutrition labels are present, then they need to be not only truthful but very clearly understandable in order to be effective. The present FOP labeling that indicates the amount of calories per serving of a pre-packaged food is simple and understandable enough. A new labeling system that includes sugar and other nutrients will be more complicated and require scientific consensus of experts. I think that a concerted effort between food manufacturers and consumers is needed for the latter to attain a healthy and nutritious diet. The role of the food industry is to offer food in the market that is nutritious, healthy, and safe, and at the same time acceptable and at low cost. It should be the concern of industry to formulate products that closely follow official recommendations on what is healthy and what is not, and at the same time avoid misleading nutrition and health claims, product labels, and advertisements. The food industry also has the important role of lending its hand in informing and educating the public on proper nutrition and balanced diet using a variety of effective strategies – through media and the Internet. Even on a voluntary basis, it would do well to use FOP labels on their products as long as they are clear and understandable to help consumers in choosing healthy and nutritious food. The food industry could help consumers understand the FOP labels they use. In turn, we the consumers should acquire sufficient knowledge of basic nutrition; know common foods that are good sources of important nutrients, and more importantly, the principles of a nutritious and balanced diet. We should then apply this nutrition knowledge in the choice of foods to purchase and consume in and outside the home in order to maintain proper nutrition. We should make it a habit to read the label in pre-packaged foods and understand and use the "Nutrition Facts" box at the back of the package and any FOP label in front, as a guide to make healthful food choices. Dr. Rodolfo Florentino, M.D., Ph.D., is one of the preeminent nutrition experts in the Philippines. He is a Council Member of the Southeast Asia Public Health Nutrition network. He is also a Scientific Advisor of the International Life Sciences Institute Southeast Asia Region (ILSI SEAR) and the Immediate Past Chairman-President of Nutrition Foundation of the Philippines. He has also served as the Director of the Food and Nutrition Research Institute of the Department of Science and Technology, among others.